Hi lovelies! 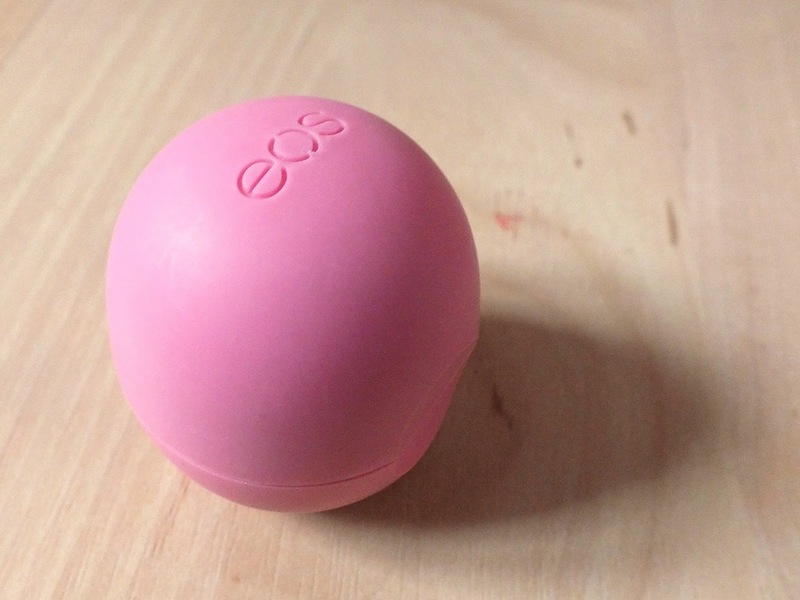 Today I'm reviewing another product from the US beauty swap I did last month, it was an item I was super excited about this one as, as you can see, it's an EOS lipbalm! These little beauties aren't easy to get hold of in the UK and while we have Balmi, which is the UK answer to EOS, it's still not quite the same. This is only the second EOS balm I've owned as I got one from another swap once and I absolutely loved it and used it to death. So I was so excited to discover this one in my lovely box of goodies from Ashley. I was even more excited when I saw that it was in the flavour Strawberry Sorbet and it was a gorgeous pink colour! I have serious issues with dry, cracked, sore and peeling lips pretty much all year round (it's as attractive as it sounds, really) and need a good lip balm to keep them soft and smooth! I've had issues with a lot of lip balms before, while some seem to do absolutely nothing and others actually seem to make them worse! However this gorgeous balm is 95% organic, 100% natural and paraben and petroleum free. It's also packed with anti-oxidents, Vitamin E and Shea Butter. So, with all these gorgeous things packed in (and nasties kept out), this balm is perfect for someone like me who has very sensitive lips. I started using this just recently but as soon as I did I noticed a huge difference in my lips literally from the first day. With all the Baby Lips hype going round, I think it's time we paid some attention to some of the other amazing lip balms out there and this is definitely one of them! From the first application, on a day when my lips were particularly chapped, it instantly soothed the soreness and made my lips feel a lot smoother and softer. I'm also pleased to say that after using this daily for the past few days, it's kept my lips hydrated and soft ever since the first use. I love the packaging of these as it's a super cute little shape that gets noticed whenever I use it around others. It's easy to apply and while the shape is definitely just for the novelty factor, it's kind of fun to apply too! There's quite a lot of product too, particularly when you look at the US prices, which is around $3 from what I've seen online. They're a little more money to buy in the UK, but this won't put me off putting in an order because I love them so much! Overall, I'd totally recommend EOS balms, particularly if like me, you have lips prone to dryness and soreness. What do you think? Have you tried EOS balms, or would you like to? My friend brought me back the raspberry/pomegranate one from the US last week! I love it, it's helped moisturise my lips so much, I always use it before lipstick application. I don't like them,they just sit on my lips and don't do anything. I recently purchased the lemon one from Selfridges in London and plan to do a review on it soon too. I agree they are so nice to use, work really well and smell/taste quite yummy! I really want to try this. My friends Uncle lives in Hawaii and sent her one and I was so jealous. I think I'd opt for Strawberry Sorbet as it sounds like such a lovely flavour. i've heard good things about this product! Why do the US seem to gives products such appealing names, strawberry sorbet? I would buy this just for name alone! This has gone my wish list for sure. As soon as I saw the picture I clicked on this post immediately!! They are super cute and I would love to purchase one. I cant wait to see what other flavours there are!!!!! I love these lip balms! This one, and the watermelon are my personal favorites! I love the look of EOS lip-balms! I would really like to try one. Aw I would absolutely love to give one of these a try, any advice on how to go about doing a swap? I desperately want to try EOS lip balms - everybody seems to love them! 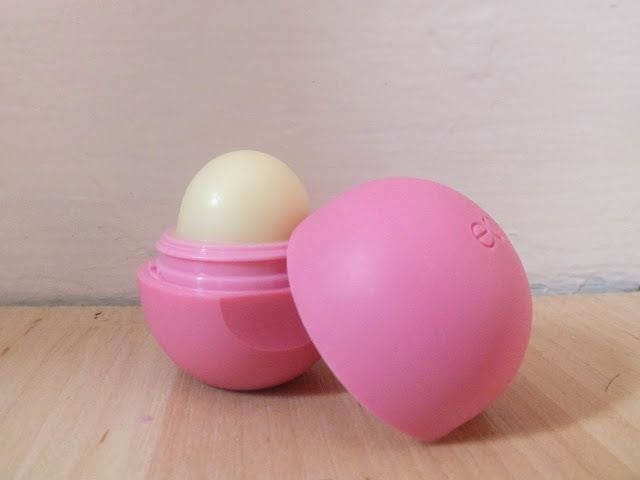 I love these, I did a post on my EOS collection on my blog (beautybabbles.com)! I can't wait till I have them all lined up, they come in such cute colours too!